Be the first to share your favorite memory, photo or story of Gina. This memorial page is dedicated for family, friends and future generations to celebrate the life of their loved one. GINA K. NUNN, of Eureka Springs, Arkansas, was born June 1, 1963, in Joplin, Missouri, daughter of Joe Sainz, Sr. and Sharon Kay Crow. 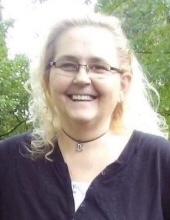 She departed this life March 24, 2019, in Eureka Springs, at the age of 55. Gina enjoyed being with family, traveling and being near water, whether it was the creek or the beach. She loved her cat, Little Guy, who isn’t very little! She is survived by her son Tony Bond, Jr. and his wife, Kristi; one sister, Ellie Yeakey; three brothers, Jim Nunn, Jay Nunn and Joe Sainz, Jr.; four grandchildren, Tylier Bond, Jali Bond, Destiny Daugherty and Tony Bond, III; several nieces and nephews, other relatives and friends. She was preceded in death by her mother, Sharon Crow; her father, Joe Sainz, Sr.; sister, Grace Nunn; nephew, James Nunn, Jr.; niece, Jazmin Nunn and grandson, Kyle Daugherty. To send flowers or a remembrance gift to the family of Gina K Nunn, please visit our Tribute Store. Or, if you would like to donate to the family, please visit Gina's Tribute Fund. Help ease the financial burden placed on the Nunn Family after the loss of a loved one by making a donation. "Email Address" would like to share the life celebration of Gina K Nunn. Click on the "link" to go to share a favorite memory or leave a condolence message for the family. Provide comfort by sending fresh flowers from our local florist or donating to Gina's Tribute Fund.